JimmyHank Williams’ interest in music began as a child pounding out tunes on the family piano and drum kit. Growing up in Austin, Hank fell deeply in love with his local guitar-slinger heroes Stevie Ray and Jimmy Vaughn as well as other types of music. Hank began his stage life at the age of 15 playing in a friend’s father’s country band and has never looked back. Currently, Hank plays music in Odessa Rose, a Denver based Americana Swing band, and can be seen performing all around the Denver area. Hank began teaching in 2003 and has found inspiration in the wonder every new student brings as well as in the evolving discussion of what music brings to each of us. Hank now lives in the Regis neighborhood of Denver with his wife, three children and cat (Otis Redding). 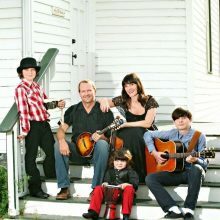 Check out Hank’s band at www.odessarosewest.com. Brian started piano lessons and singing at age 6 in small-town Kansas. He performed in churches and theaters throughout his childhood and early adulthood, including stints as the Scarecrow in his high school’s production of the Wizard of Oz, and touring with his college summer-camp band in the early 1990s. He studied theater and music in college, where he first picked up guitar. With guitar in hand, he has entertained children and adults alike wherever he has lived, including Tokyo, Austin, Washington, DC, and now Denver. 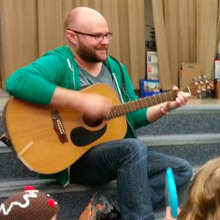 Brian first joined Rocky Mountain Aardvarks accompanying classes on the guitar in 2012, and has loved each opportunity to join tots and their grown-ups since then. His other day jobs include freelance photography and writing. When he isn’t working, you’re likely to find Brian hiking in the mountains, or planning his next road trip. He can’t wait to play and sing with you all very soon! Growing up in Washington state among a boisterous family of seven children, Clare began Suzuki violin lessons in second grade. She played in the local youth orchestra through high school, and added the title of theater geek to her illustrious resume with a performance in the school musical. Clare was a member of the jazz choir in both high school and college, sang in the church choir on occasion, and belted show tunes at the top of her lungs wherever she went. She moved to Colorado after college in 2001, and began playing guitar and writing songs shortly after. One fateful night in Evergreen, she fell in love with a musician, and quickly came to enjoy the camaraderie of the local bluegrass music scene, learning traditional songs and dusting off her old violin at late night jams. Together with her husband (the above mentioned bluegrass musician) she now plays fiddle and guitar in a 5-piece Americana band called “Old Fuss and Feathers” that performs at beer gardens and ice cream parlors across the metro area. They live a happy life in North Denver with their three sons and two cats. In addition to her career as a musician, Clare has been a kids yoga teacher for the past five years, and loves having fun with kids and parents while spreading a message of peace to the next generation. Mark was born and raised in Colorado and began playing piano as a young boy. Early on he was inspired by his Grandmother, an incredible musician who played piano and organ in the old silent movie houses. She taught him the importance of sharing music, and that is something that he has always carried with him. Mark continued to play piano and trumpet until an athletic career took him from high school to the University of Kansas where Track and Field became the top priority. After college Mark returned to Colorado and rediscovered his love for music. He learned how to play mandolin and guitar, finding his chops out on the road playing some of the largest festivals in the country including Wakarusa, Summer Camp, 10K Lakes, and Shangi-La. Now Mark makes his home in Lakewood, and although not touring as much he keeps busy playing in a few local bands, and as the music director for a church. 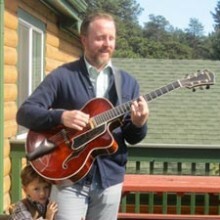 When not playing music, Mark can be found raising a young daughter and playing in the mountains. 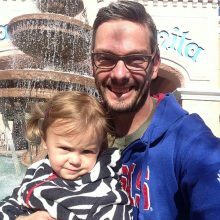 Mark is excited to bring his love of kids and passion for music to the Rocky Mountain Aardvarks.